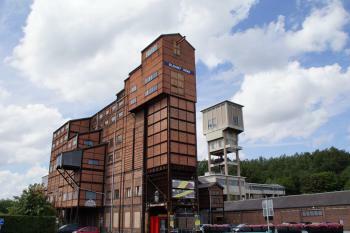 The Major Mining Sites of Wallonia are the best-preserved coal mining sites in Belgium. Developed in the 19th century, the Walloon mining basin became an exemplary centre of the Industrial Revolution outside England. "Major Mining Sites of Wallonia" consists of four separate sites: Le Grand-Hornu, Bois-du-Luc, Bois du Cazier and the mine of Blegny. They represent coal mining in the 19th century, when Belgium was the 2nd most important industrial nation. I set out to visit Le Grand-Hornu and Bois-du-Luc on a day trip from my home in the Netherlands. These two former mines are located about 30kms apart, in the same region as 2 other Walloon WHS (Spiennes & the Four Lifts). Le Grand-Hornu already is a pleasant surprise at first sight. It stands out as an architectural diamond in a poor looking neighbourhood and looks very well-maintained. 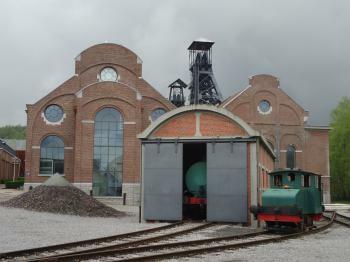 This former mine complex now houses a couple of exhibition rooms, a restaurant and the Walloon Museum of Modern Art. Entrance was free today, as was the pretty good audio guide that is available in several languages. During the first minutes of the one hour tour the narrator of the guide already tells you: this is not really a visit to a mine: there's nothing left of the works underground. You come here to see the neoclassical buildings, modelled after Arc-et-Senans. Unfortunately I've never seen this French WHS, so I cannot compare how much they look alike (and if this prevents its Belgian counterpart to become a WHS also). 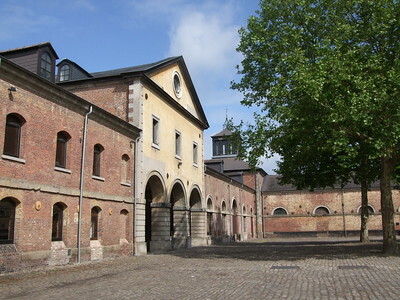 The main area of Grand-Hornu is an amazing oval square, surrounded by former ateliers, offices and a building that housed the steam machine. Most of the construction is made of brick. 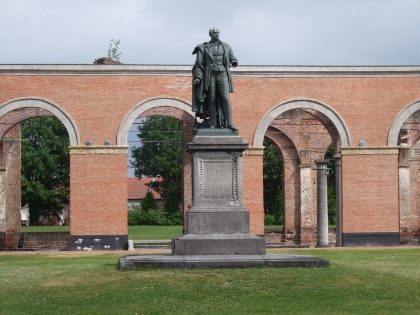 Henri De Gorge, the first owner, is honoured by a statue and a family museum on site. He also had 400 houses for workers built in a model town surrounding the site. They still are there, as are the broad cobbled streets. I then slowly finished my walk on the grounds and enjoying the rather perfect design of its buildings. My visit to Bois-du-Luc was less eventful: the site was half-closed, and I had to wait a long time before a guided tour would start. I had a quick look at the surroundings (looks definitely more industrial than Grand-Hornu) and decided to leave it at that, and drove home. From the descriptions at their joint website, I gather that the mine of Blegny is the only of the four that has not been dismantled. It was closed in the last quarter of the 20th century. It might be a clever choice of the Walloon authorities to put these four locations together - the sum here is probably better than the parts. There are already many mines and town planning sites on the WH List. It closed down in 1973 and has been a museum since 1983. What’s so great about this site is the way that it’s been protected. There are new exhibits inside some of the old buildings but not much has been changed structurally, other than for safety reasons. It means that it’s easy to walk through and see everything – but it still feels authentic enough. Whilst these certainly aren't the highlight of a trip to Belgium they did provide an interesting point of reference on a recent WHS mega weekend around the area. Our route south pushed us in the direction of Liege, as such our first visit was to the mines at Bligny, the only one of these sites where you can still get below ground. Sadly some unexpected road works led us to arrive shortly after a tour departed. Not really having enough time to wait we wandered around the structures above ground. The most striking was the climb up the slag heap, offering views across the former mining landscape. We also got to see the other attractions Hubert mentions, and like him we weren't especially interested, however the use of former lumps of mining machinery as a crazy golf course was kind of amusing. A quick pit stop in the cafe was the limit of our visit, though it did allow us to see a fair chunk of the local community out for a catch up, which was rather nice to see. This was an enjoyable visit even if we missed the chance to head underground. A couple of days later we made an unexpected visit to le Grand Hornu. As it was a Monday the main site wasn't open. However, and not for the first time, we encountered a wonderful welcome from people working at a world heritage site. They explained some details, such as the relationship to Mons' role as the current European Capital of Culture, and even the visits that Vincent Van Gogh paid. They even let us head out for a stroll around, which was all we were interested in anyway. It was a pretty impressive architectural ensemble, though its mining functions were somewhat hidden. One of the things I found most interesting was the endless rows of small terraced houses that surrounded the central buildings. These always remind me of my home city, and as such help illustrate the large impact of such sites. On the whole I didn't feel that I got a full grasp on the heritage of the mining sites; however that was mostly due to my missing the tours and interpretation that was available. These aren't going to top many people’s lists of must see sites in Belgium; however it did give me a better appreciation of the history of this area, beyond the usual views of the glorious cities of Flanders. Just visited - April, 2015. Only one location - Bois du Cazier - relatively easy to see if you are in Charleroi (in fact Bois du Cazier is currently part of the city). There is a public bus to go there (# 52) starting from Charleroi-Sud, but it is not very frequent (on Sundays there are only 3 buses to go to the mine). It is better to use bus # 1 - ask the driver to drop you in the place nearest the mine - around 2 km by foot or take any bus to Marcinelle (more frequent) and take some walk from there (3-4 km, check on the map, where to go). The site itself is well organised, prepared for mass visiting (Industry Museum, Glass Museum, expositions) with special hall devoted to the biggest catastrophe in the history of Belgian mining. We visited the Blegny coal mine on a day trip from Aachen. Blegny is a small village near the Belgian-German border, about 10 km from Liège and 30 km from Aachen. 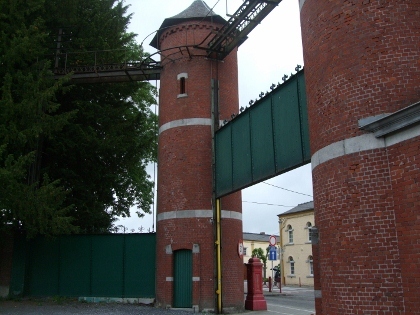 At its closure in 1980, the Blegny mine was the oldest and last operating mine in the region. Preserved are the headframe and the coal washing plant from the 20th Century, the building and pithead of the older Marie mine, and underground shafts and galleries. Blegny is the only of the four parts of the WHS, where an underground tour is available. The tour starts with a short film about the history of the Blegny mine and the mining region. Then, equipped with a helmet and a miners coat, we took the original elevator to a level 30 metres below ground. Actually, the elevator is a two-story cage, small and narrow, thus you should not suffer from claustrophobia. Regular tours are only in French and Dutch, but there are audioguides in English and German. The guided tour provides information on the history of mining, from the tough working conditions 200 years ago to the automated production methods in the late 20th Century. Our guide was a former miner, he had a lot to tell, his explanations were always much longer and seemed to be more amusing than the text on my audioguide. Unfortunately, my French is not good enough to understand all his anecdotes and jokes. We walked along the mining gallery and went down to a level of 60 metres below ground, then we took the elevator to the top of the shaft tower. Above ground we visited the conveyor belts, the coal washing plant and the facilities for the further transport of the coal. 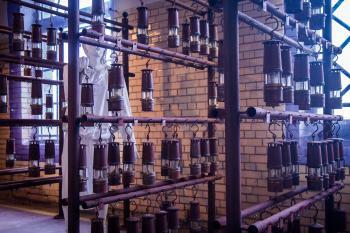 These devices are in the most remarkable construction of the mine, a large building of red brick with metal frames, built in the 1940s. The entire tour lasts about 1.5 hours and we enjoyed it very much. However, I like to visit mining sites and industrial heritage. 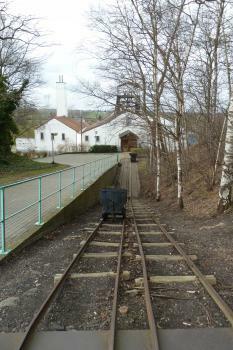 The building of the Marie mine is the oldest part of the site and houses the worth seeing mining museum. It is much larger than it appears from the outside and shows an abundance of machines and devices, including the showers of the miners. We spent almost two hours there. You can also climb the mine heap and have a panoramic view of the pit and the region, but we skipped that because it started to rain when we finished our tour. There are also several attractions for children: playgrounds, a road-train, miniature golf, a small animal park, aviaries. That's not to my taste, but it obviously helps to draw interest of children to the industrial heritage. All in all a worthwhile day trip, in particular if you like to visit mining sites. I visited the Grand-Hornu and Bois-du-Luc sites this Summer 2012. I think that the sum of these sites together was a wise choice for entry as a WHS. I wasn't very impressed by the Bois-du-Luc site. The main entrance gate is just about the best thing there is to see as the museum and the rest of the site is being refurbished now that it has been given the WHS status. The Grand-Hornu on the other hand was very well kept, very friendly and helpful staff welcome you and are willing to give you information. I was impressed by how big this site was and by the fact that so much attention was given to build this mining site. Once you go in this site, you would think it could be anything BUT a mining site!!! 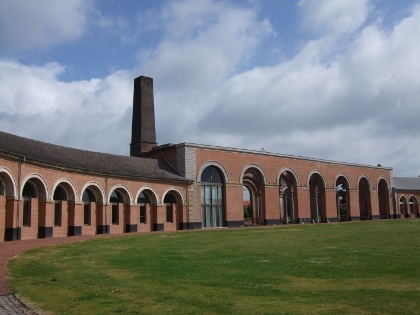 Really worth visiting Grand-Hornu and perhaps Bois du Cazier has much more to offer than the other 2 sites. 2.5: Els Slots Argo MaxHeAnou Peter A. Scientific Developments: Georges Lemaître, Father of the Big Bang, is buried in the cemetery right next to Bois du Cazier, in the central zone.